It's just too good when you get the bridesmaids to relax and laugh! I love it. I love it. I love it. Sometimes the timeline runs behind because of a long ceremony or greeting line and there's some stress in the wedding party. What do you do when you need to make up time on the wedding day while simultaneously making every bridesmaid (and the bride) feel confident and beautiful? What's a girl to do?! That's your homework for the week. Just kidding. I'm going to share how I take natural photos of the bridesmaids because it's too good when they are all laughing and they don't even realize time is passing! I once thought that it would take a long time to take great photographs of the bride laughing with her bridesmaids. I have learned that's not true! They all really love the bride and would do anything for her (hello, bridesmaid title!) so you just need to position them and get going! I like to start with a traditional photo! This helps the group relax a little because everyone knows how to look at the camera and smile. I ask them to keep their bouquets at their hips almost every time! I wanted to show you an exception to that little rule in the photo below. Instead, I asked the bridesmaid behind the flower girl to bring her bouquet up just a little. This helped to frame the flower girl so she wasn't lost in a sea of flowers! Plus, I took a few steps closer to take this photo shortly after! After the traditional photograph, I love to take a photo that feels more candid! I love to move in close and just focus on the bride! These always end up being some of my favorite photographs! Put the focus on the bride! It's easy to get fake laughter if the bridesmaids are still nervous! I encourage them to be confident and feel beautiful. I give them little prompts, too: "Tell Madalyn every wonderful thing about her!" This puts the focus on the bride, who already feels really comfortable in front of my camera, and helps them to let go and have some fun! If I'm working with a group of sisters or sisters and cousins, I like to take the traditional photograph and also take a photo that feels more relaxed and true-to-the-group! I tell them to lean their heads on each other, bump shoulders, laugh together, and just soak up the moment! 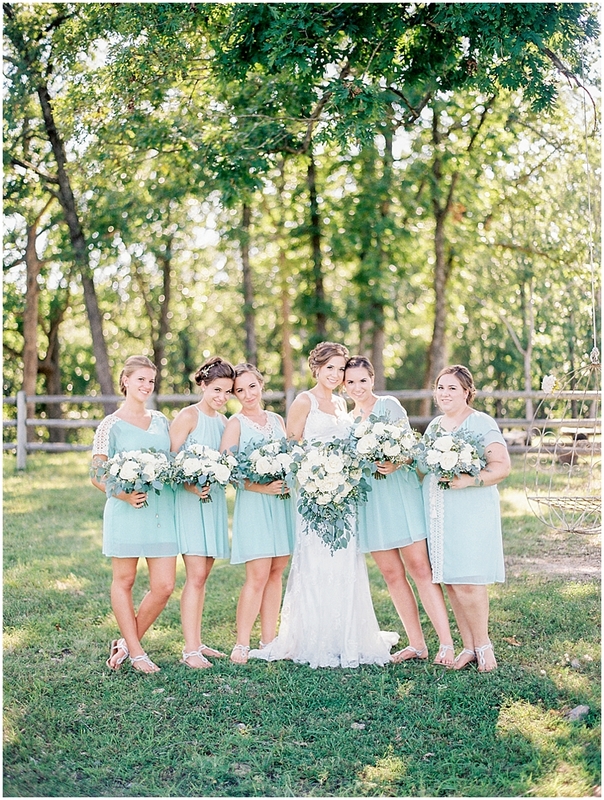 Don't forget the photo of the bride with each of her bridesmaids! This is such a special photo and I love making it a little extra special. If you're working with a really nervous group of bridesmaids, try photographing the bride and each bridesmaid before you take photos of the entire group! And if you have a little extra time, you can make the bridesmaids feel special by taking a photo of just them! One of the best ways to serve your clients is to serve the people around them! When you make the bridesmaids feel special, you are doing just that. And also, making someone feel beautiful is a good enough reason to work extra hard!